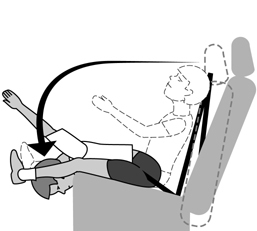 A six-year-old in a belt-positioning booster seat (top) will barely move in a 30 mph crash, while a six-year-old only restrained in a seat belt (bottom) will bend far forward and is at risk for head, organ, and spinal cord injuries. Children who are shorter than 4' 9" tall need booster seats, which are required by law in Pennsylvania and New Jersey until age 8. Last month, I published a study as part of a research alliance between The Children's Hospital of Philadelphia and State Farm Insurance Companies. The study had a startling finding: parents over 35 were among the least likely to use appropriate restraints for their children in motor vehicles. Using data collected from thousands of parents, we looked at specific factors associated with inappropriate restraint use for children in motor vehicle crashes. Compared with younger parents, parents over age 35 were about 25% more likely to use seat belts rather than child restraints or booster seats for children under age nine. The likelihood of inappropriate restraint among parents over age 35 was similar to that for parents with a high school education or less and for parents with low income. Children in the four to eight-year-old age group had the highest likelihood of being improperly restrained, with 65 percent riding in an adult seat belt instead of in the appropriate car seat or booster seat. Motor vehicle crashes are the leading cause of death and acquired disability among all U.S. children older than one year. Previous studies have shown that using age and size-appropriate child restraints reduces a child’s risk of injury in a crash to less than one percent. For all children under 4' 9" in height (at least through age nine), riding in an adult seat belt alone puts them at twice the risk of injury in a crash, compared with using the right car seat or booster seat for their age and size. In particular, these children are much more likely to suffer serious abdominal and spinal injuries, known as “seat belt syndrome,” which are caused by an improper fit of the belt. Data for this study were gathered from interviews with 3,818 parent-drivers who were in crashes involving 5,146 restrained children age nine and younger between the years 2000 and 2004. These interviews were conducted as part of the ongoing research alliance of The Children’s Hospital of Philadelphia and State Farm, Partners for Child Passenger Safety, that is the world’s largest ongoing surveillance system of children involved in real-world crashes. The crashes studied occurred in fifteen states in the Eastern, Midwestern, and Western United States, including Pennsylvania. The parents in our studies want the best for their children, but studies like this one point to the fact that parents are often unknowingly putting their children at risk. In another of our recent studies we found that as children age, their risk of injury or death in a motor vehicle crash significantly increases due to improper child restraint use. A key factor for this increased risk includes moving children from child restraints to adult seat belts and then to the front seat prematurely. In fact, the report found that in 2005, 46% of children ages four through eight were improperly restrained in adult seat belts, making them three times more likely to be injured in a crash than younger infants and toddlers. 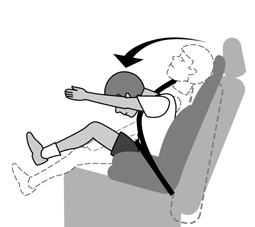 For children under the age of eight years, following the guidelines for age and size-appropriate restraints can reduce the risk of serious injury in a vehicle crash to less than 1%. State Farm and The Children’s Hospital of Philadelphia urge parents to be diligent when it comes to their children’s safety – every ride, every time – because the majority of crashes with children occur within ten minutes from home. In addition to updating their own child restraint practices, parents need to check with other parents who are carpooling their children, as well as with their children’s schools and preschools. I just reviewed the parent handbook for a local Jewish day school, and under the safety section, it did not include the requirement for booster seat use for children through at least age eight years, the current law in Pennsylvania. Just as other areas of technology continue to change and improve, so too does safety technology. We need to make sure that we are keeping up with the latest technology so that our children will be safe. I have seen the regret of parents who realized too late that their children suffered injuries that could have been prevented if they had been appropriately restrained in the rear seat. Parents seeking straightforward and accurate information about how to choose and install car safety seats or booster seats can visit CHOP's website to find educational videos and information in both English and Spanish. They can also locate a certified child passenger safety technician in their community who will instruct them how to properly install these seats.